Round 2 of the NFC playoffs gets underway Saturday night when the Dallas Cowboys take on the Los Angeles Rams. Dallas one the NFC East this season with a 10-6 and advanced to the second round courtesy of a 24-22 victory over the Seattle Seahawks. The Rams won the NFC West Division, tying the New Orleans Saints for the top record in the NFL at 13-3. Los Angeles won the last playoff meeting between these two teams, defeating Dallas in January of 1986, 20-0. The Dallas Cowboys found themselves trailing 14-10 heading into the fourth quarter of their first-round playoff matchup, but two fourth quarter touchdown runs would give Dallas the lead as they held on for the 24-22 victory. Running back Ezekiel Elliott helped lead the comeback, rushing for 137 yards and a touchdown on 26 carries, including the go-ahead touchdown that put the Cowboys back on top. Quarterback Dak Prescott would score the decisive touchdown, adding a 1 yard run that capped off a 5:12 drive. Prescott finished with 226 yards passing and another 29 yards rushing. He both rushed and threw for a touchdown. If the Cowboys are going to win this game it is going to be because of the play of their defense. Dallas is allowing opponents an average of 21.4 points per game. DeMarcus Lawrence led the team in sacks during the regular season with 10.5, and Randy Gregory and Tyrone Crawford had 6.0 and 5.5 sacks respectively. Pressure is going to be necessary against Rams quarterback Jared Goff if Dallas is going to pull out the victory. 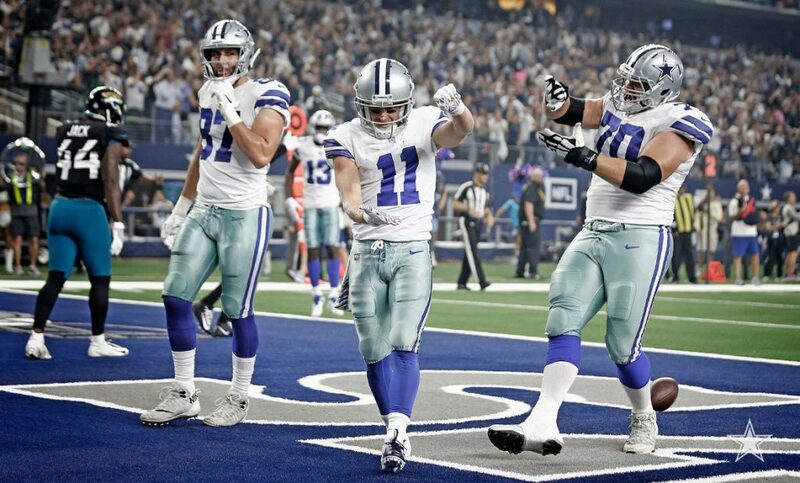 The Cowboys are averaging 21.4 points per game, gaining 346 yards per game of offense on average. They are going to need at least 10 more points per game to win this contest. Dallas is allowing 327.5 yards per game with an impressive 93.3 yards rushing per game. It is surprising that these two storied franchises have not squared off in the playoffs since 1986, but it would not be a surprise to see this rivalry renewed on a regular basis, at least from the Rams standpoint. Los Angeles has one of the best offenses in football, and they look to keep it that way behind a star-studded quarterback-running back tandem. The Rams finish with 401 total points this season, led by Goff who threw for 4688 yards and 32 touchdowns. He only through 12 interceptions, completing 64.9% of his passes with a 101.1 quarterback rating. Surprisingly, the Los Angeles quarterback wasn’t even the star of this offense. Running back Todd Gurley is the star of the show here, rushing for 1251 yards and 17 touchdowns, this despite sitting out the last two games of the season. Six times this season Gurley rushed for at least 100 yards, including a season-high 208 against Denver on October 14. While the defense has recorded only 33 sacks this season, they still make plays. Los Angeles forced 31 turnovers, including 18 interceptions, three of which were returned for touchdowns. John Johnson led the team with four interceptions and was second in total tackles with 119. Aaron Donald led the NFL in sacks with 20.5, an impressive number considering the team only had 33. The Rams are averaging 32.9 points per game while allowing 24.0 points per contest. They are averaging 421 yards of offense while allowing 358.6 per game. 1-4 ATS in their last five games in the playoffs. 0-4 ATS in their last four games in January. 2-5 ATS in their last seven playoff games on the road. 0-4-1 ATS in their last five games against teams with a winning record. The Rams have one of the most exciting teams in the NFL and have a variety of weapons that are going to be difficult for Dallas to contain. Not only do they have two stars in Goff and Gurley, but they have a great offensive line that provides plenty of protection. Dallas is not a scoring machine, and they are going to need at least 30 points to win this contest. Considering that they only reached that mark two times this year doesn’t bode well for them. Look for Los Angeles to dominate this game, scoring early and running away with it. The total is set at 49.0 for this contest. Offensive Lee, the two teams combined for 54 points per game while allowing 44 points per contest. Clearly, the oddsmakers split the difference. We look for Los Angeles to roll over Dallas in this game, which will mean that the Cowboys will have to throw to win this contest, not a way for them to win. Look for Los Angeles to pull out the victory 31-14, so take the under.